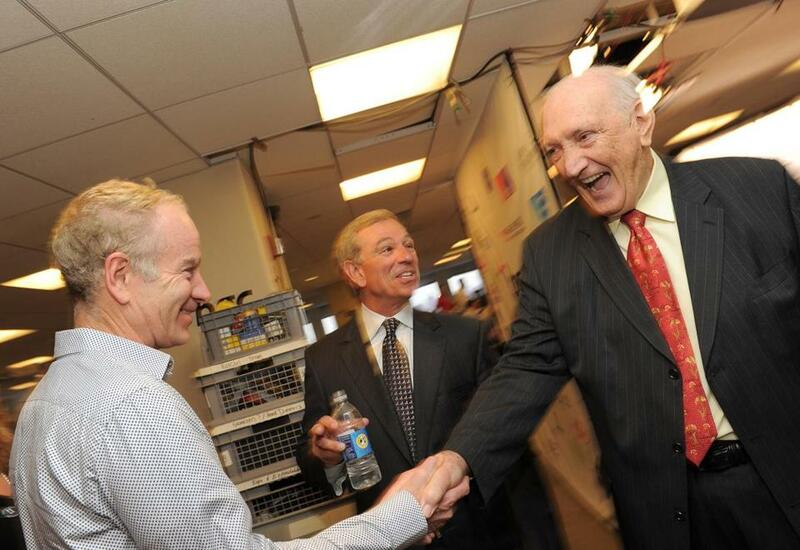 John McEnroe, left, Bobby Valentine, and Ralph Branca attended a charity event last September in New York City. Bobby Valentine’s famous father-in-law, Ralph Branca, is best known for giving up the walkoff ‘’Shot Heard ‘Round the World’’ to Bobby Thomson in the 1951 National League playoff game between the Brooklyn Dodgers and New York Giants that sent the Giants to the World Series. In his new book, ‘’A Moment in Time,’’ Branca details his feelings about the pitch he never lived down and about an amazing life and career, including his relationship with Valentine, who married his daughter Mary. ‘’Above everything, Bobby is a wonderful person who would do anything for you,’’ Branca said. ‘’We’ve been so close for so long. In the mid 1970s, Valentine invited Branca and his family to Santo Domingo for a vacation, and that’s where Valentine met Mary and started dating her. And the baseball conversations have never ceased. In Valentine’s managerial stints with the Texas Rangers, New York Mets, Chiba Lotte Marines, and now the Red Sox, Branca has never been afraid to throw his two cents in. He has had his share of baseball arguments with his son-in-law, but he believes him to be a great manager. ‘’You’ll never see a more prepared manager, because he practices everything,’’ Branca said. ‘’When I was down in Fort Myers, I heard [Lou] Piniella say on TV that it was unusual that the infield would be in in the second inning. Well, it’s spring training and Bobby is getting them used to what they might need to do in the seventh inning. ‘’That’s what he does. He always thinks ahead. Branca said he has had great debates with Valentine: For example, why does the first baseman line up in front of the runner rather than in back of the runner, or whether a changeup should be at least 10 miles per hour slower than a fastball. He said Valentine has always had the ability to adapt to the type of team he has. ‘’I just remember that Mets team he brought to the World Series [in 2000],’’ said Branca. ‘’That team had an outfield that hit 32 homers the same year Barry Bonds was hitting 70. 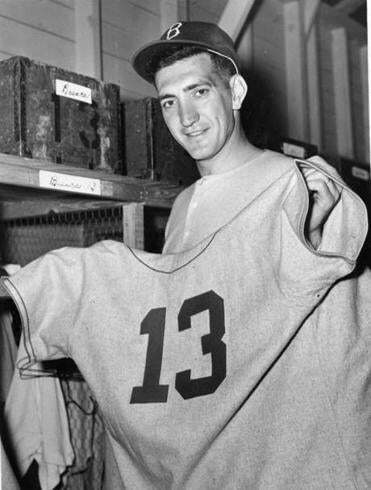 Ralph Branca played from 1944-1954. Branca was born in Mount Vernon, N.Y., to a Jewish mother and an Italian father. His father was a trolley car conductor from Italy. Branca grew up a huge Dodgers fan and remembers riding the subway and bus for 90 minutes just to get to Ebbets Field. He signed with the Dodgers in 1943, made his major league debut on June 12, 1944, and had a 3.04 ERA in 109„ innings as a rookie in 1945. He became a 21-game winner at age 21 in 1947 and was a three-time All-Star. In 1949, after getting over a painful shin injury — a freak accident when he was hit by a ball — he went 13-5, for a .722 winning percentage. In all, he won 80 games for the Dodgers. Branca, who became close friends with Thomson, later found out from former Tiger Ted Gray that the Giants were stealing signs in 1951 and relaying them to hitters. Many years later, former Giants catcher Sal Yvars told the Wall Street Journal that he was the one who relayed signs to Thomson in the playoff game. Thomson, who also homered off Branca in the first game of that three-game playoff series, denied to Branca that he had any help on the pennant-clinching homer, but Branca didn’t believe that. Branca’s career might have been fairly forgettable if not for ‘’the Shot,’’ which is considered by many the greatest moment in baseball history. Unfortunately, Branca was on the short end of it, but the grace with which he dealt with it earned him respect around the world. Branca, who sat disconsolate at his locker for many minutes after the homer, has had an incredible life. During that memorable 1947 season he was the only player who was willing to line up next to Jackie Robinson. In his final spring training appearance he was relieved by Sandy Koufax, who fanned Thomson for his first major league strikeout. Already, his presence around the Red Sox has been welcomed, especially by the veteran members of the organization. Branca is a colorful storyteller who can entertain the masses as well as his son-in-law can. ‘’Ralph Branca is truly a giant, not only in baseball annals but in the history of his generation,’’ said Red Sox senior adviser Jeremy Kapstein. ‘’His exceptional baseball achievements are matched by his incredible intellect, loyalty, determination, and integrity. * Like many war-time rookies, Branca made his debut in 1944 quite young, at 18 years, 6 months. His first, last, and most memorable pitching appearances all came against the Giants. * In 1945, Branca averaged just 5.991 hits per nine innings, still third best in Dodgers history. * At age 21, Branca had his finest season in 1947, ranking second in the NL in wins (21), strikeouts (148), and innings (280), and finishing third in ERA at 2.67 after making a league-leading 36 starts (as well as seven relief appearances). * Pitching in early relief for the Dodgers in a must-have Game 6 of the 1947 World Series against the Yankees, Branca got the win with 2 1⁄3 clutch innings. * In four World Series appearances, Branca held the Yankees’ three future Hall of Famers — Joe DiMaggio, Yogi Berra, and Phil Rizzuto — to 5 hits in 22 at-bats. * From 1947-49, during which the Dodgers won two pennants, Branca won a team-best 48 games with a 3.40 ERA while logging 6821⁄3 innings. Branca started the 1948 All-Star Game for the NL, allowing two runs in three innings. It was his only All-Star appearance though he was named three straight years. * Taking on more of a swing role in 1950 for the Dodgers, Branca started 15 games (completing five), closed out 16 other games, and had seven saves. * Branca’s two career home runs came during a six-week span in 1950, both against the Pirates at Forbes Field. They came off of Cliff Chambers and Vern Law.